Visiting heralded sites of Texas history was educational, thought-provoking, and a whole lot of fun. 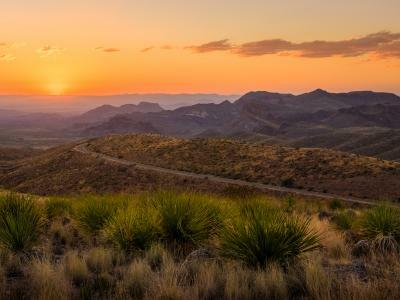 From an early 19th-century battlefield to a 1901 oil gusher, the Lone Star State historic sites are truly blasts from the past. Texas has an exciting and multicultural history. Explorers from Spain, France, and Mexico established early settlements, followed by immigrants from several European countries. It wasn’t until the Texas Republic gained its independence from Mexico, however, that life changed for the people of those diverse cultures. They all became the first official Texans. Since then, Texans have changed history in other ways as well. 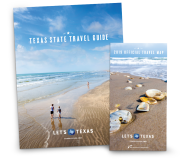 Several spots along the Texas Gulf Coast help tell that story, and last year we made the effort to visit a few. In April 1836, an exhausted but determined group of soldiers led by Sam Houston overwhelmed the Mexican Army of Santa Anna, shouting “Remember the Alamo!” It was a horrendous defeat for Mexico and the beginning of the great State of Texas. We were reminded of those details on a visit to the San Jacinto Battleground State Historic Site, located just east of Houston. 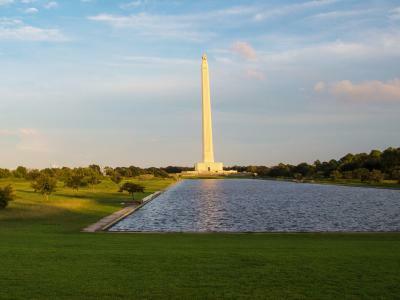 Covering 1,200 acres, it’s made up of the battlefield, a monumental obelisk topped by a lone star, and a 1,750-foot-long reflecting pool. The Battleship Texas is also nearby—something we’ve wanted to see but would have to do another day. Walking over the battleground—shaded by towering oak trees—we read granite markers that noted where each army was before the battle, where Houston’s forces advanced, the spot where Santa Anna surrendered, and more. The monument was started 100 years after the battle, on April 21, 1936, and was completed exactly one year later. In its base is a formidable museum with almost 300,000 documents and books covering more than 400 years of Texas history. We spent a half hour there before taking the elevator up to the observation floor. The view was amazing, stretching from the battleground and reflecting pool to the Houston skyline. For dinner, we treated ourselves to the Monument Inn, a favorite in the area since 1974. I’d never been, but after we’d split the Fisherman’s Platter (shrimp, oysters, catfish, stuffed shrimp, and stuffed crab) we understood why people come back again and again—as would we. In January 1901, the newfangled rotary-type drill bit that wildcatter Anthony Lucas had been using at a salt-domed section of oil sands hit something. Mud began bubbling up, then suddenly six tons of drilling pipe shot out of the hole, followed by an oil geyser that reached 100 feet or more. It took nine days to cap it, and the oil field known as Spindletop was born. Located on the campus of Lamar University in Beaumont, the Gladys City Boomtown Museum tells the story of Spindletop—the first of many successful wells drilled in the area—and how it revolutionized American transportation and industry. We took the self-guided tour, which led us through a replica of a “boomtown” city in the Spindletop era. The saloon, general store, stables, and other structures showcased furniture and objects of the time, so it was easy—and a bit delusional—to imagine ourselves becoming rich oil barons in the early 20th century. The old photographs were our favorite. One image showed dozens of oil wells built practically on top of one another. In another, suddenly-rich townsfolk sported their fancy new duds. And in more panoramic photos, new rigs that had been cobbled together were towering over homes and businesses across the city. It was humbling to walk the decks of this massive, record-breaking carrier and see the anti-aircraft guns mounted on their swiveling platforms. Imagining the young men handling those guns and what they must have gone through made us both think about our fathers, proud veterans of WWII. Belowdecks, the differences between captain’s quarters and enlisted men’s bunks were obvious, and we saw areas that served the everyday needs of a carrier this size—the crew’s galley, a library, sick bay, and the dentist’s office. The enormous machinery in the engine room made us realize just what a complex job it must have been to keep this beauty going. There were some great new things added to this historic ship, including a 3-D mega theater, the Warbirds and Warships Gallery with hundreds of small planes, ships, and submarines, and the one I couldn’t get my husband to leave—the virtual battle stations. These ingenious simulators let him be the pilot in a dogfight while I brought a fighter jet in for a landing on the ship’s deck. After the Spindletop gusher blew in January of 1901, land prices in Gladys City skyrocketed as speculators poured into the area. One man had been trying for three years to sell his property for $150. After Spindletop, he sold it for $20,000. Fifteen minutes later, that buyer turned around and sold it for $50,000.